Conservative politicians, preachers and “pro-family” advocates are in heat over the gay pride flag’s presence outside the Federal Reserve Bank building in Richmond, Virginia. 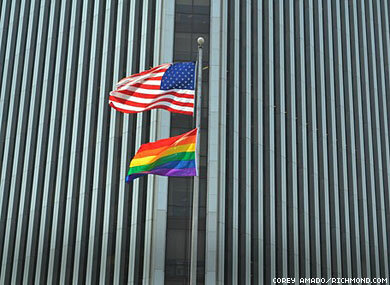 An internal group of LGBT employees, called PRISM, requested that the flag be flown in honor of Gay Pride month. The bank, which is a private institution, obliged. In Virginia, this is not a stand that should be taken. We’ve as a state said we are not going to support gay marriage, for example, in our constitution, and we’ve been very clear on issues of gay rights. So it’s disappointing to see such a large flag flying, as if it’s something that this commonwealth supports. I look forward to the month where I look out my office window and see the Christian flag hanging during September, celebrating Christian Heritage Month. I suspect we’ll see otherwise, unfortunately, because that’s the route our culture has taken. You know what, crazy “pro-family” type that really seem to relish in the fact that you have defeated our struggle for the same rights as other Americans? Go ahead, and fly your flag as well. You already have every single politician in this country ending speeches with “God Bless America,” so what’s another month of flying the Christian flag? Go ahead, crazies. Raise that flag, show your Pride, but just now that we are not like you. We believe in minorities’ rights to express themselves, enjoy basic human rights, and be the same as other Americans. We may think you are crazy – but that doesn’t mean that we don’t respect your right to exist – even if you hate us to the very core of your being! Meanwhile, tell the Seattle Space Needle to fly the flag during Pride this month!